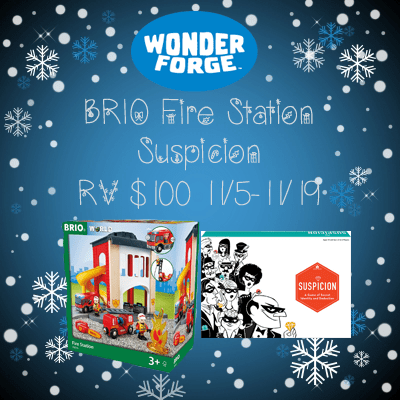 BRIO Fire Station – At the rescue fire station you have to be prepared for action. When the alarm goes off, slide down the slide to the fire truck which is ready for take-off, with sirens and all. The toughest fireman climbs up to the helipad on the roof. Come on, hurry up! Suspicion – You’re invited to a masquerade party at the estate of art collector Baron Whitetooth. Little does he know, you’re a world-class jewel thief. And you are not alone. Keep your identity a secret as you maneuver through the mansion pocketing priceless gemstones. Observe the other guests and use deduction to unmask the other crooks before they catch you. Ilove to make the holiday cookies and pastries which we give as gifts. I love stuffing! I love stuffing and gravy for left overs! My favorite dish of the holidays would be Lactose Free Egg nog with a slice of Pecan pie. I feel like saying that my favorite holiday dish is any I didn’t have to cook. lol However, I do like the roast pork we have every Christmas. I like making stuffing and turkey for the holidays., but the pies are pretty good too.